This is the Colton family tomb in Mt. View Cemetery. David Colton died in 1878 and was known in his time as a railroad magnate and land owner. His wife may also be buried here but there is no information on her dates on this planet. Just like Nellie, her history was given short shrift. 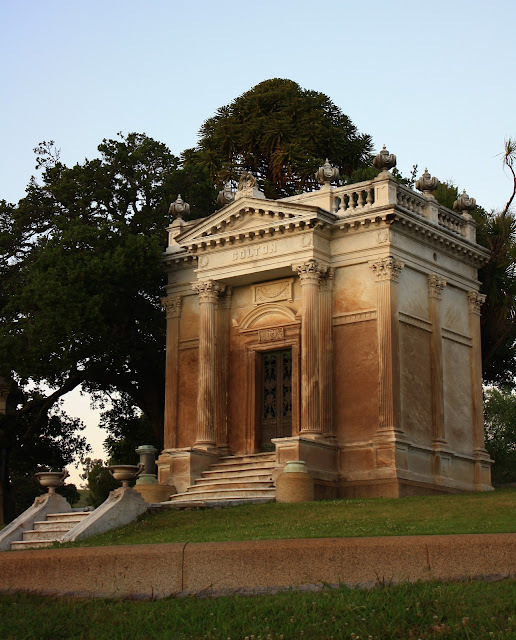 The cemetery is full of large tombs like these, many of which seem no longer to be connected to succeeding generations. Kind of sad. This photo was taken late one afternoon and is straight out of the camera. For more SOOC photos, visit SOOC Sunday. Until now, I've never seen tombs of this size! It is sad to see it in a neglected state. It a very nice shot. A beautiful photo with excellent colors. More than a tomb looks like a palace. By the way, last night, there was a program on France Culture (radio) about Oakland and author E.M. Williamson. This is so huge..plenty of money! Sad his wife was not mentioned! Nice shot! Quite a place. Mine is under construction . . .